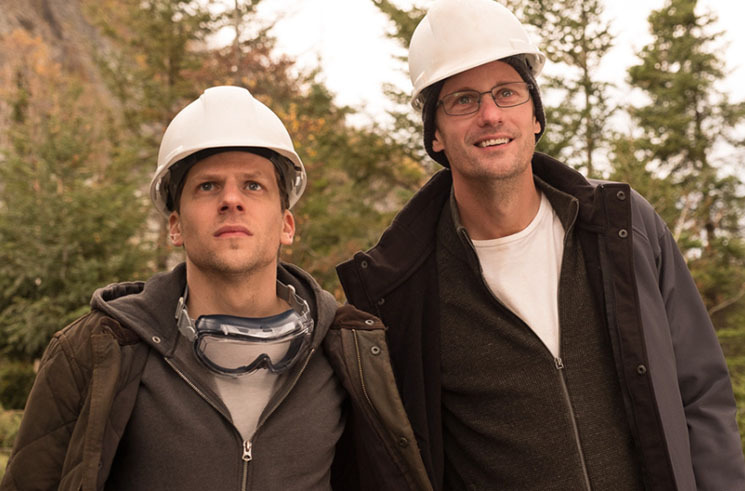 When Vinny (Jesse Eisenberg) and Anton Zaleski (Alexander Skarsgård) set out to build an underground cable from Kansas straight to the New York Stock Exchange, they want to get stock market data a single millisecond faster than their peers, and with that, hundreds of millions of dollars. The Hummingbird Project, the latest from Montreal writer/director Kim Nguyen (Two Lovers and a Bear, Rebelle), is more than an entertaining financial thriller about chasing money down a fibre optic cable. Vinny, not so different from Eisenberg's Mark Zuckerberg in The Social Network, fills the fast-talking, sleek Wall Streeter role, but the challenge of getting the cable to work fast enough is largely a mathematical one. This is where Skarsgård comes in, transformed into a socially awkward, balding brainiac, who gets sucked into the world of coding for days at a time. The other obstacle in Vinny and Anton's way is Eva Torres (Salma Hayek), a badass boss lady with a Cruella de Vil vibe. Their former employer, Torres is determined to get the numbers at an even faster rate, rendering their project obsolete. Hayek is riveting, and Torres' sharp confrontations with Anton create a side tension more compelling than the primary narrative. Vinny, meanwhile, never manages to be particularly likeable. Despite facing an increasingly serious health issue, and chronically oversharing his hardships with random walk-on characters, it's the supporting characters who carry the film. Even their hired contractor, Mark Vega (Michael Mando), has a certain sweetness to his involvement, coming across as loyal, but out of place, as if he took on the project just because he had nothing better to do. Nguyen raises ethical questions about their fibre optic cable, and the larger financial industry behind it, but doesn't linger on them. Clearly a film that doesn't take itself too seriously, he pushes, instead, the drama of scenes that may otherwise be mundane, from Wall Streeters smashing their keyboards into pieces, to Anton strutting down the hallway to a soundtrack of the Beastie Boys. So while The Hummingbird Project may not quite achieve the tenderness it was aiming at, it's a surprisingly fun and engaging watch.